Why your Website is Going to be Marked as "NOT SECURE" by Google? Home » Web Hosting » Your Website is Going to be Marked as “NOT SECURE” by Google! Read Why? Your Website is Going to be Marked as “NOT SECURE” by Google! Read Why? Website’s security is one of the major concern for any online businesses. Therefore, Google has decided to take it to the next level. Hmm, so what Google is planning? Well, Google is going to declare websites which are holding HTTP as “Not Secure” in the upcoming 68th version of its web browser Google Chrome! Version 68 will be released in the first week of July 2018 and will mark all HTTP sites as “Not Secure”. 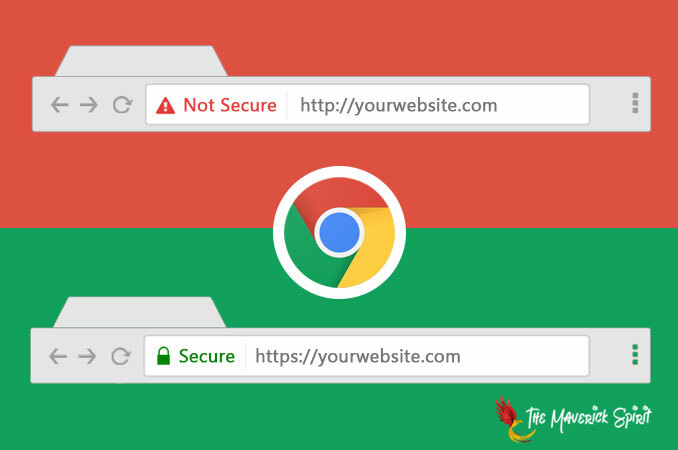 You all might have noticed that Google Chrome displays an information icon for an HTTP site, but in its 68th version, an extra notification will be displayed to the users in the address bar as a Warning. When you will click on this info icon, you might get a message which says, “Your connection to this site is not secure!”. On the other hand, Google Chrome displays “Secure” along with a green lock icon for HTTPS sites. Although Google has not forced users, instead it has always asked them to switch to HTTPS from HTTP. This is the first forceful step taken against the HTTP websites we have ever seen by Google. Apart from Google, Mozilla Firefox and other major browsers are also planning to increase the security for the web. So, Why HTTPS is better than HTTP and Why you need to switch to HTTPS from HTTP? HTTP is a communication protocol which established a connection between you and the website you requested. But HTTP is not secure and your data might get stolen in between the process. HTTPS establishes a secure connection between you and the website. The data sent and received is encrypted and worthless for anyone who has not the corresponding key. Google prefers HTTPS websites over HTTP websites when it comes to rankings and showing results. This is one of the major reasons why you should switch from HTTP to HTTPS. It not only increase your website’s security but improves search engine rankings as well. How to enable HTTPS on my website? Every domain will have a separate SSL certificate. You don’t need an additional SSL certificate for subdomains. You need to migrate all URLs to HTTPS from HTTP on your website. You can do this by 301 redirects. Where can I get SSL certificate from? You need to purchase the SSL certificate. Many services offer SSL certificate at different prices. How to decide where to buy from? Well, we have enabled HTTPS from HostCron which is providing the SSL certificate in a very economical and cheap price without compromising with the quality. HostCron offers 4 major types of SSL certificates based on your requirements. Ideal for personal websites, blogs, social media or any website that is not transmitting private and confidential information. This type of certificate provides you a step up in credibility over Domain Validated SSL. It enables your corporate identity and let the site visitors trust that the website is handled by a legitimate company. It is the highest class of SSL available in the market and provides more trust and credibility to your website in comparison to both of the above. It displays your company name instead of “secure” in the green part of the address bar. Wildcard SSL certificate allows you to secure unlimited subdomains on a single certificate. Domain Validation is issued to a single Fully Qualified Domain Name, i.e., themaverickspirit.com. It will only secure the exact domain, but not subdomains. On the other hand, a Wildcard SSL is issued for all the subdomains, i.e., *.themaverickspirit.com, where the asterisk represents all subdomains. The wildcards are available for Standard SSL Certificates and Organization Validation Certificates. Switch to HTTPS before Google announces your website as NOT SECURE. Get your SSL certificate at the most affordable price from HostCron. Why pay more when you can get it done at low cost? Enable HTTPS for your Website using HostCron! 000Webhost Review – A Cost Effective Hosting Solution for Business Website! Google’s Mobile-First Index: What It Is & It’s Impact on Mobile SEO!